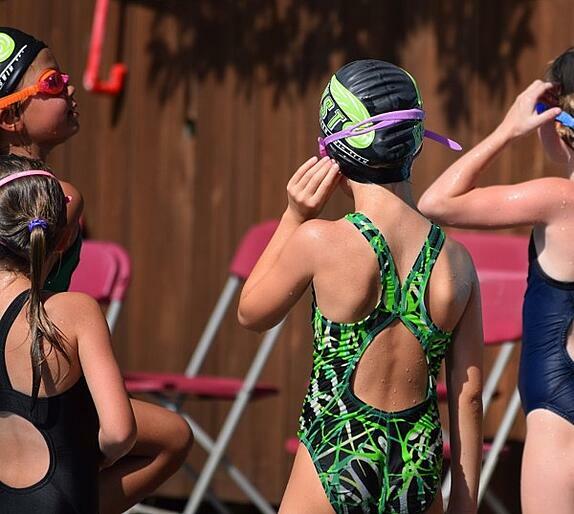 What skills, in and out of the water, do kids on your swim team learn? The swimmers on the Mustangs will be learning stroke technique for all four competitive strokes, swim pacing, racing techniques, in addition to leadership skills, social skills, decision making and problem-solving. Swimming really helps your brain connect with your body and helps to enhance/strengthen those connections. They are also doing dryland training which is really important for helping build strength and helps with injury preventions. I am a huge fan of stretch cords! What is the best thing for kids to eat before and after a tough workout? I recommend that the kids eat a snack about 30 minutes before swim practice. Since they are coming straight from school that can be challenging, so I suggest they find a healthy bar they can pack in their backpack. If they plan ahead, they can eat a snack they packed in the morning such as a peanut butter and jelly sandwich, string cheese and crackers, apple slices or a baggie of carrots and hummus. It’s also important to drink water throughout the day and during practice. After a tough workout, it’s always recommended to have some protein and carbs. The perfect choice for this is chocolate milk! It’s a great recovery drink and easy to make. 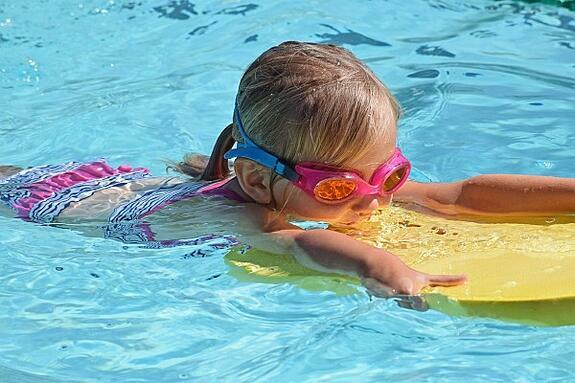 Competitive swimmers get their competitive edge at SwimLabs Swim School! Are you interested in competitive lessons or stroke video analysis? Visit a SwimLabs near you! If parents are questioning whether to sign their children up to swim on a club team, what would you tell them? I suggest that parents have their children come and try out a couple of weeks of practice and to have the coach assess where they are at. It’s difficult for them to know exactly what it’s like unless they come and try it out first hand. Swimming on a club team is a big commitment, so I always ask them to make sure they are ready for a higher level of commitment, especially if they have never been on a club/year-round team. Some swimmers can be really intimidated about joining at first, so they may want to just come and observe a couple of practices, so they can see how the team practices, what the coach is like, etc. They should also do their “homework” by talking to other parents and swimmers currently on the team. When kids get in the car after practice, what are a couple of questions you would ask them? What was the best part of practice today? What new skill(s) did you learn at swim practice? Did you have a good time? Is your coach helping you improve? How important is goal setting for first-time club swimmers? 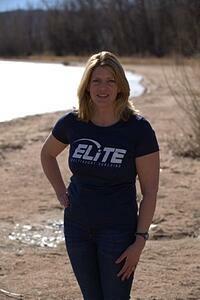 Goal setting is always important for any athlete, but especially when attempting something new. There are outcome-based goals and process goals, and both are important. For example, if a swimmer has a goal of swimming the 100 Free in under 1:00, how are they going to achieve that goal? It might involve technique work/changes, as well as attending a certain number of practices, and a timeline to achieve this goal if it’s realistic for the swimmer. I like to help each swimmer set realistic and some “pie in the sky” goals. How can swimmers best prepare for the first meet of the season? Most importantly, they need to attend practice regularly. They should be eating well and getting enough sleep at night, so they can come to practice ready to work hard. We do a lot of race preparation by swimming fast at practice, going off the blocks and practicing starts, in addition to time trials and intersquad competitions. What are some good questions kids should ask their lane mates so they get to know each other? I like to get my swimmers to interact with each by mixing up the lanes during a kick set where they can kick side by side, or by playing some games at the end of practice. We do scooter races, partner sculling, relays, and many other social activities to encourage them to get to know each other. Some questions they can ask each other include: Where have you traveled to? What’s your favorite animal? Who is your favorite Olympic swimmer? What is your favorite stroke and event? Who do you most admire? Thank you, Stephanie, for your wonderful advice and information! Regardless of where your child is as a swimmer, whether it be just starting out and testing the waters, or competing at a higher level, the endurance, challenges, and learning along the way helps to create personal goals that your child will use far beyond outside of the water. If you are interested in learning more about lessons at SwimLabs Littleton or are looking for a location near you: Contact us! We would be happy to help and answer any questions you might have!